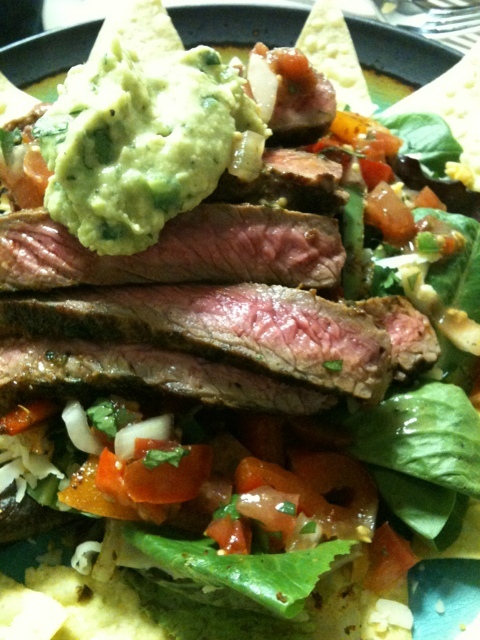 food: fajita salad | eat. drink. fly. friends, this is a no-brainer blog post. this is what happens when a girl that is notoriously addicted to fajitas has to stop eating them because the tortillas are on the no list. she finds a way to eat them anyways. from my vast 7 weeks of paleo knowledge, the easiest way to turn a non paleo dish into a paleo dish is to make it into a salad. we started with steaks. good steaks. we went with strip loin. 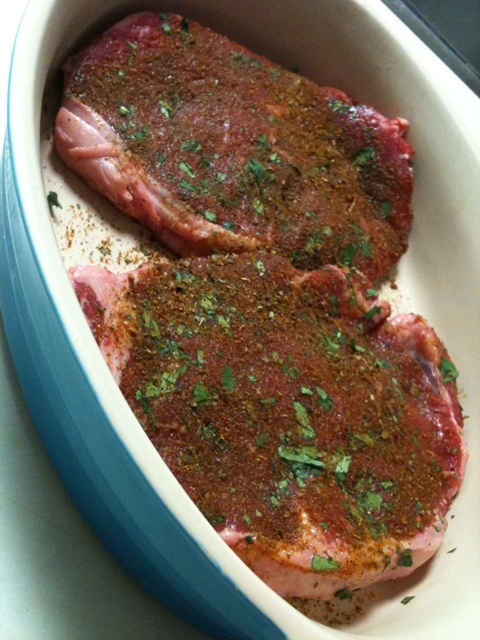 then it got a healthy dose of fajita seasoning. mine comes from only one place and nothing else is an adequate substitute for my tastebuds. i buy paul prudhomme’s fajita magic online. my mom has been using this stuff since i was a kid and we mail ordered it. this is seriously the best stuff ever. i am so loyal to it and i use it often. i can’t do it justice on the internet, but if i’ve ever made you fajitas in my house and you’ve said “damn, those are the best fajitas ever”, this is my secret not so secret ingredient. anyways. everything tastes awesome with fajita magic on it, but we had a ton of fresh cilantro so we used some of that too. 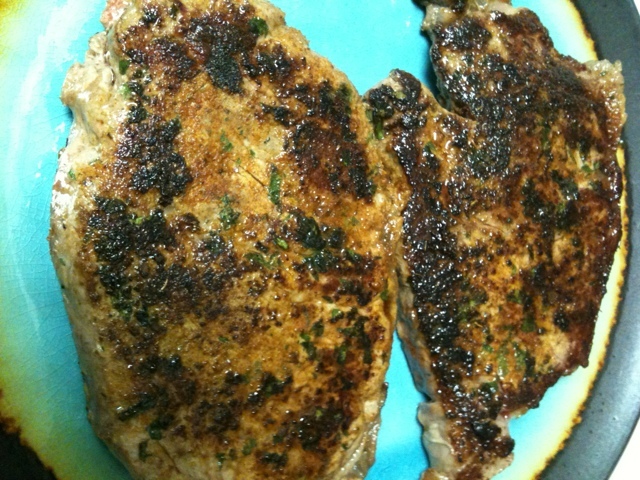 then i pan seared the steaks. because it is way too cold for me to bbq. and i actually enjoy a pan seared steak when cooked properly. and i built the salad with mixed greens (aka – the lettuce in my fridge at the time) some grated pepper jack & cheddar cheese (oops, not so paleo) and some homemade pico de gallo. 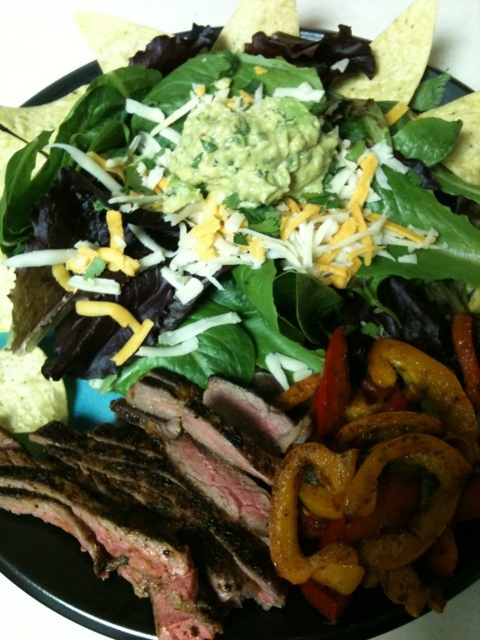 continued the load up with the peppers & onions, sliced steaks and topped it off with a whack of homemade guacamole. 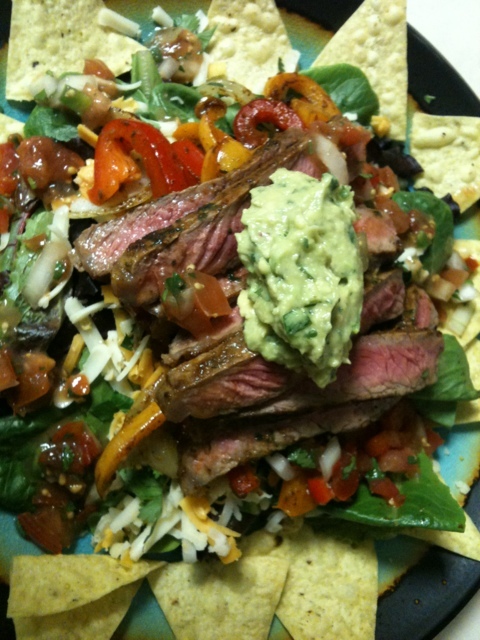 this one is my husband’s… he likes lots of corn chips and pico de gallo and everything in one big pile. i like everything separate so i can build my salad mouthful by mouthful. i also don’t like onions, so the pico de gallo was a pass for me. and i totally cheated on paleo with a sprinkle of cheese and a couple corn chips.